The Open Church Elisabethen in Basel is an unusual and unique location for various events. Take advantage of the ambience with its up to 20-meter-high ceilings, stylish columns and colorful glass windows, through which the daylight falls, for your individually planned events - an experienced and professional team on site makes it possible! The church is very well connected to public transport and the main train station can be reached on foot in just about seven minutes. One of the neighbors in a central location is the theater. Whether a cultural event, concerts or exhibitions - standing you can accompany up to 700 people! Depending on the seating option, up to 400 guests can still sit down. This historic 19th-century building, with its neo-gothic architecture, is an ideal setting for romantic wedding receptions. A modern lighting and audio technology is available to you and can be extended if necessary by the partner Konnex. Look forward to fascinating lighting of columns as well as of the choir or outside area. On request, you can also switch off the light sector by sector or continuously dim. The sound system with media players, speakers and microphones allows you to hold speeches, a subtle background music or a boisterous party with dancing. 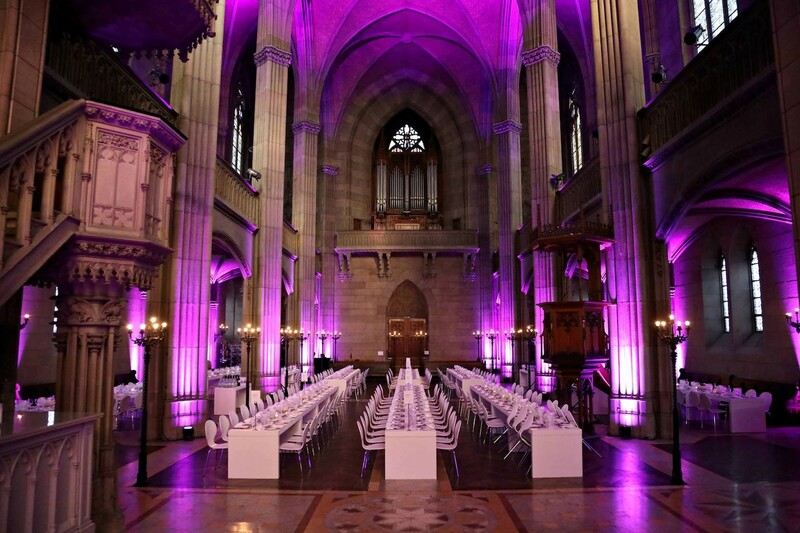 Inspire your team or your customers in the course of various business events also with the impressive scenery of the Elisabethenkirche! Conferences and lectures are as much in good hands here as large corporate parties, exhibitions or product presentations in the pop-up store. For your physical well-being are two high-class caterers ready. The Café Bar Elisabethen spoils up to 120 event participants with Italian delicacies and excellent wines, while the Radisson Blu offers buffets and food trends for all group sizes.